All you have to say is Dutch soup to conjure up an image of vegetable broth with small meatballs. The size of meatballs depends on the energy of the cook. 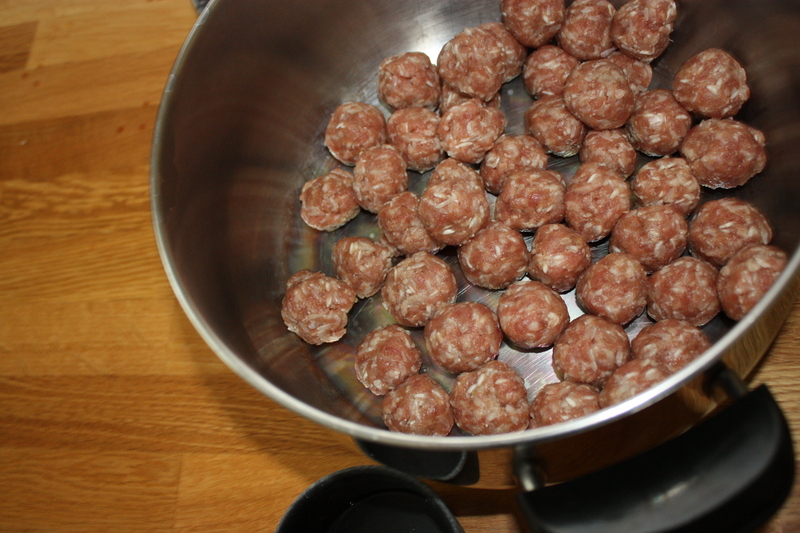 The smaller meatballs are preferable but it is a time consuming task. The soup is a simple vegetable broth, seasoned with Dutch spices that you can likely find at Dutch or European grocery. Soups are always adaptable, so think of the recipe as a starting place and adapt it to what you have in your fridge or your tastes. Gwen learned this recipe from her mom, and like many of us, this was often a weekend meal accompanied by fresh bread or sandwiches. 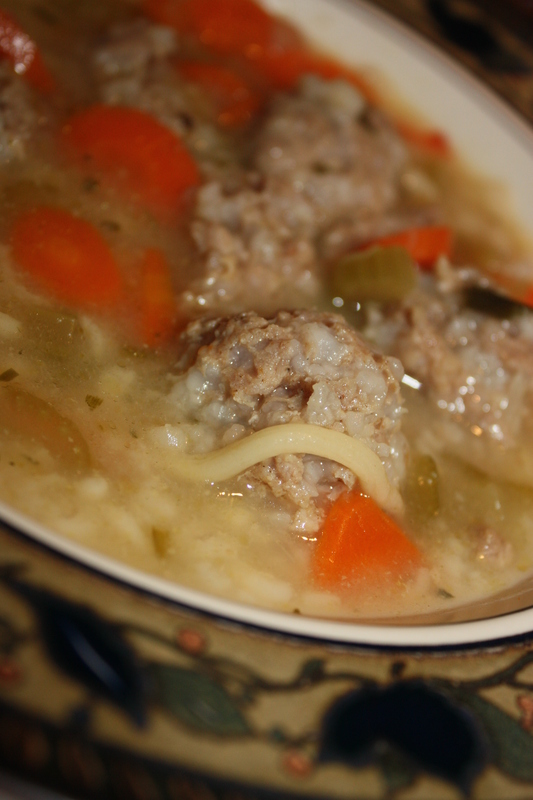 The great thing about cooking soup together is that after an initial flurry of chopping and making meatballs we could have tea and chat while the soup simmered away, the scent of warm soup colouring our conversation with memories of past family meals. Options: Instead of pork you can use leftover chili or roast beef or add 2 cans tomato soup to make it a tomato based broth. Fill a large pot (Dutch oven) halfway with water. 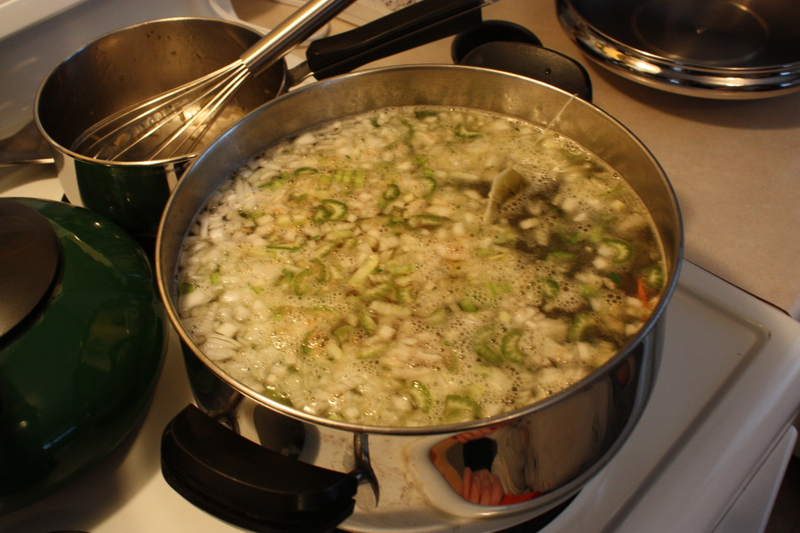 Add barley and cook over medium heat while you prepare the rest of the soup. Dice vegetables and set aside. In a bowl, mix together ingredients for meatballs: ground pork, spice mix, rice, and salt/pepper if using. Roll mixture into meatballs and set aside. Make them as small because you want them to be single bite sized. Add meatballs and chopped vegetables to pot. Feel free to alter the amounts and types of vegetables for the soup. Mix Julianne soup mix with 2 cups of boiling water and whisk with fork or whisk so there is no lumps. Add mixture and one spice bag to pot. If you want noodles, break spaghetti noodles into smaller pieces and add to pot. Cook, covered on medium heat for at least 1 ½ to 2 hours. Stir occasionally. Add more water or noodles when desired. Add salt to taste (this can vary depending on the type of spice mix you use). I am a 2nd generation Canadian(on my paternal side), with my Dad’s parents coming from Holland just after the war. I wondered if this was just my Grandma’s thing but I am really pleased to see it here so I can recreate it myself. She passed a few years ago and my children haven’t been blessed with all her yummy food. Thank you! I am so glad that you can use the recipe. Food definitely brings memory with it. I love passing it along to the next generation.